"I have no excuse!" said Maria. "I have an elliptical and a treadmill in my bedroom. My husband has the weight machine set-up in the garage. There is even a park by my work where I can walk before going home. I have no excuse." Maria, like many people, tried losing weight with "diet" alone. She was subtracting foods from her diet, but she wasn't adding anything. She wasn't moving, which kept her from moving toward her weight loss goals. 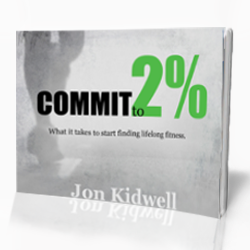 If you've read Commit to 2%- What It Takes To Start Finding Lifelong Fitness you know what it takes to start losing weight and living healthy. Now it's time to learn why we start with movement and not diet. Diet alone doesn't cut it. It doesn't matter if it's me, Jillian Michaels, or Weight Watchers. All health professionals say losing weight and living a healthy life comes from diet AND exercise. That is no secret. The problem is the focus and the order in which we are told to tackle losing weight. Dieting has long been looked at as a taking away. Diets limit food intake. Fats. Carbs. Sugars. Calories. You name it there is a diet that cuts it. The problem with dieting alone is we give up foods we love for the hope of a slimmer waist. We don't add, we only subtract and are left feeling without. We create a void. Eventually, the void will be filled. Most likely with food, and we return to our previous weight or worse we gain even more. The second problem with dieting alone is our emotional attachment to food. We have long used food for rewards, for comfort, and for celebration. Those events continue to happen whether we are on a diet or not. Instead of hurting someone's feelings by saying 'NO' we give in to an unhealthy option, feel like we've blown everything, and quit dieting because we believe we have failed and will never succeed. Weight loss needs to start with moving because it adds value to our life. Exercising is the first step toward a sustainable, healthy life. Engaging in exercise engages our brain. John Ratey says, "Exercise is like MiracleGro for our brain." Exercise has been proven to aid in decision-making. A vital skill for losing weight. Do you want fries with that? No! Moving also motivates. When we finish exercising we feel accomplished. We've achieved. We believe we can conquer anything. That's because being physically active releases endorphins in our body improving our mood and in turn reducing our stress level and pain sensors. It boosts our self-esteem and makes us more confident in our abilities. Here are some more reasons why losing weight starts with exercise. Exercise reduces the risk of heart disease, stroke, and type II diabetes. Being active burns calories and speeds up the weight loss process. Moving our bodies speeds up our metabolism which increases our ability to lose weight. Exercise helps avert addictions (food or others). Exercise assists in controlling the disorderly effects of hormonal changes. Start moving. Move no less than 30 minutes EVERY day. Make being active a part of your daily life. Moving isn't the only ingredient to a healthy life. It also takes a consciousness of our calories consumption and eating real, quality food to build and maintain a healthy life. BUT moving is where to start. The first step is literally taking the first step. SO...get off the couch, out of the chair, away from the computer, and get moving today! Have you tried losing weight by changing your diet alone? What happened? I don't care how much I change my diet, I can not keep the weight off unless I exercise. I've tried changing my diet alone but I always end up facing the weight back.